Time for the Benevacantists to give it up. Nice try. Lol We ain't going nowhere. Wheres as the side against the validity has expounded in great detail the philosophical, theological, moral, forensic and above all canonical reasons that indubitably show that the resignation never took place in valid form. 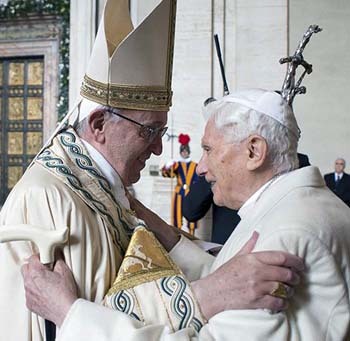 #ppbxvi There is no Catholic position in any controversy, but that which is in harmony with and derived from the Natural, Moral, Divine and Evangelical Law: Canon 332 §2, says that a Pope resigns when he resigns his munus, not his ministerium, freely and publicly. B16 never did. Those who contradict this and who urge you to ignore this fact, are advocates of the Devil, who was a Lawbreaker from the beginning. Cardinals who are clueless about these things, who elected Bergoglio in defiance of them, are thus certainly NOT sound judges of the matter. Have you all seen this? This came out on TIA recently, and it seems Veri Catholici is giving them some serious flack for it. Perhaps, there is no warning from Our Lord that it is more appropriate for the time in which we live today. For years now, and especially since the current phase of the calamitous project of the destruction of the Faith that moved to high speed with Pope Francis’ reign, many priests and laymen react surprised and scandalized over the buffoon we see sitting on the cathedra of St. Peter. If I were to speak of surprise, I would like to say that the surprise is mine and also of many others like me who for years have been fighting Progressivism, this neo-modernism that managed to reach the highest places in the Hierarchy of the Church. "Felix qui pout rerum cognoscere cause" said Virgil (Fortunate is he who was able to know the causes of things). This surprise is due, today more than ever, to the emergence of absurd theories that claim to show that there is a radical break between Francis and the other Popes of the post-Vatican II Council, to the point of supposing that Francis would not be Pope. So, today I want to expound, on the one hand, on the almost delusional incoherence of this position and, on the other, on the danger there is in abandoning oneself to the guidance of those who, based on extravagant and arbitrary whims, claim to uphold superficially (or at times through a merely emotional fanaticism) a movement without its feet set in reality, like the ones who hate Francis (the consequence), but have nostalgia for Benedict (one of the causes of Francis' election). Those who support such nonsense not only seem to act as schizophrenics, but are also publicly denied by Benedict himself who has repeatedly stated that his resignation has been well-deliberated and definitive. He adds: "A weak point is perhaps my lack of clear, purposeful governance and the decision that have to be made there.,. So, practical governance is not my forte, and there, I would say, is a certain weakness." (Ibid., pp. 255-256). Furthermore, in a letter addressed to the Secretariat of the Prefect for Communication, Msgr. Dário Edoardo Viganò, which he writes on the occasion of the presentation of the Collection, The Theology of Pope Francis, Benedict XVI says that there is an "internal continuity" between his pontificate and that of Francis. His words are: "I welcome this initiative which intends to oppose and react to the foolish prejudice according to which Pope Francis would be only a practical man deprived of particular theological or philosophical formation, whereas I was only a theoretician of theology who understood little of the concrete life of a Christian today." And he adds: "These small volumes rightly show that Pope Francis is a man of profound philosophical and theological formation and, therefore, help us to see the interior continuity between the two pontificates, although with all the differences of style and temperament." Furthermore, on June 28, 2016, on the anniversary of the 65th priestly ordination of Benedict, a ceremony was held in Clementine Hall, where Pope Francis was also present. In his brief final greeting, Benedict XVI speaks again of mercy: "Thanks above all to you, Holy Father! Your kindness, from the first moment of the election, in each moment of my life here, really moves me inside." He continues: "More than in the Vatican Gardens, with their beauty, your kindness is the place where I live: I feel protected. Thanks also to the word of thanks, of everything. We hope that you can go forward with all of us on this path of divine mercy, showing us the path of Jesus towards Jesus, towards God." Finally, the letters of Benedict XVI to Cardinal Brandmüller - which have recently been published - absolutely destroy any dream of those Ratzingherians who pretend that he is still the Pope. In the first letter of November 9, 2017, Benedict XVI states as clearly as possible that only Francis is the Pope. His words to the Cardinal are these: "As Pope Emeritus, I tried to create a situation in which I was absolutely inaccessible to the mass media and in which it was fully clear that there is only one Pope." 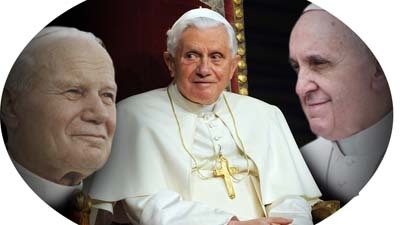 We see that the Ratzingherians try to show that the resignation of Benedict XVI is invalid are baseless. The arguments put forward do not proceed. However, those "arguments," despite their variety, lead to a single result: Benedict XVI is still Pope and, so, Francis is not a true Pope. This speaks volumes about the real reason for these attempts: It is not so important to understand how things are, but rather what end they want to reach, which is to state that Francis is not a true Pope - in one way or another. 1. Those who say Benedict is Pope are in a state of trauma because they cannot sincerely admit that Francis is an extension of Benedict. This would be something like a kind of spiritual schizophrenia that prevents them from reconciling cause and effect because they will not accept that Benedict has abandoned them. 2. Or, those who promote this theory are hypocritical scoundrels who simply want to take advantage, confuse people and, through this confusion, constitute themselves as an infallible criterion for determining who is and who is not the Pope. If we give these people the benefit of the doubt and consider that they are innocent, then, they do what they do out of ignorance or from the painful disappointment they possibly have upon learning that "Saint Benedict" is an example far from what holiness is. 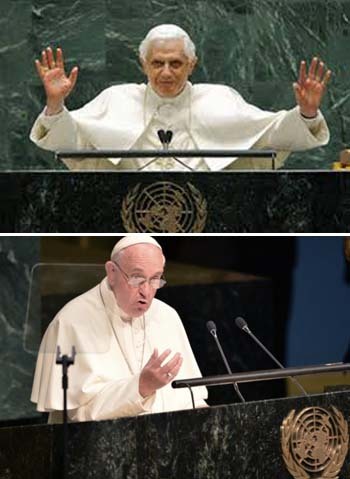 Yes, it is not just Francis' fault if there is a decline of the Faith in the whole world. The catastrophic situation in which the Church finds herself is the result of years and years of attacks directed against the doctrine, the liturgy and, in general, everything that represents the Kingdom of Christ in society. For the sake of the argument, if we admit the hypothesis that Benedict resigned under the pressure of a mafia, this mafia could not have had power unless if had been bolstered by the previous conciliar Popes and by Benedict himself. Should we also blame Francis for this? 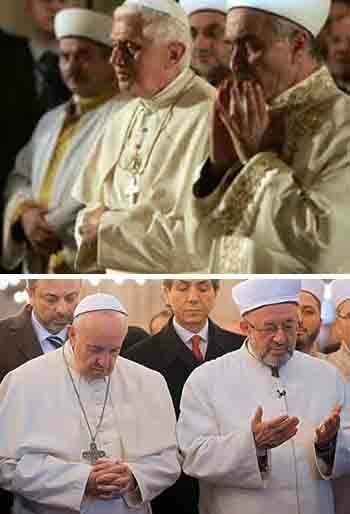 At any rate, it does not seem a very honest or courageous position for a Pope who resigns and abandons the flock when the wolf is inside it. In short, for decades our Pontiffs, wander around as if they were drunk. Their dependence on the absinthe of Progressivism and Modernism continually increase. They roam in the dark night of Humanism. Perhaps the Bavarian has better hidden his intention than the Argentinian, but at the end of the day, both walk hand in hand, singing the same tango and staggering in the same direction. TIA is radically opposed to Benedict, basically because they consider him a modernist. Unfortunately, they have a bad case of AA Fever. 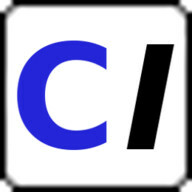 It is hard to blame them, however, because Dr. Guimaraes has been immersed in the errors of VCII--writing books, and very good ones, in order to expose them--and cannot conceive of a conversion for any of them--it is a sad state of affairs. Furthermore, most people just cannot understand the operation of the demonic in the Vatican, in the Church or in the world. I don't know Fr. Paul Norton nor his background, the author of the article on TIA, but apparently a friend of Dr. Guimaraes and closely involved with Our Lady Help of Christians traditional Church in Garden Grove, CA, if he doesn't live there. However, he shows a great lack of knowledge about Benedict's renunciation and what he does know is superficial. I really doubt if he really sat down to study the matter; he most likely just read a few documents and listened to what others were saying, including TIA, and took the ball from there. The new psychology so prominent today seems to have been unwittingly absorbed by society today, even by traditional Catholics. The idea of conversion appears to be totally abandoned. the avant-garde AA has been one of the culprits convincing the poor alcoholics that they have a "sickness" that can't be cured and by means of transferring dependency on the bottle to dependency on the group actually keeps them "sick". But practically for all modern psychology there is no sin (indeed no such thing as a soul even), only sickness, and that as long as sin (of which a large portion of all the psychosis and neurosis being but the symptoms) is not treated properly, that field is perpetuating the "sickness" and the "patient" rather the penitent keeps coming back to increase the psychologist's or psychiatrist's bank account--the poor patient comes to believe he can't be cured. And so goes society. Hence, Benedict, because he was a liberal can't be cured; he's always going to be a liberal. But anyone who has a conscience, while not involved with the B'ni B'rith (Cardinal Bea among others), Masons, Communism or some other secret society, cult, Lobby or Mafia, and is exposed to the 3rd Secret of Fatima IS going to be converted. Fr. Malachi Martin and Cardinal Luciani (the future Pope John Paul I) are just two examples of those who were directly acquainted with the 3rd Secret and converted; perhaps even John Paul II to a certain extent, for example, in his effort to consecrate Russia. I challenge anyone, therefore, to prove that his knowledge of the 3rd Secret of Fatima did not change Benedict. He freed up the Old Mass; had the humility to admit that it had never been forbidden; lifted the excommunications of the SSPX; changed the vernacular editions of the Consecration of the Chalice to the proper wording ("for you and for many") and many other things he would not have done back in the '60's and '70's; he went against the Party Line of Sodano and Bertone concerning the Fatima Message. Furthermore, no one can make the claim that they know more about what is going on in the Church than Benedict--indeed he has more first hand knowledge in his little finger than everyone in the streets or on the internet! I exaggerate a bit, of course, but he does know what is going on. And going around publicly proclaiming the past liberalism of Joseph Ratzinger is still present today, even by insinuation if not by direct accusation, is tantamount to calumny, if one cannot prove what he says--a most serious sin and a grave injustice, especially when one takes into consideration the honor due to Benedict. And only when one knows all the facts, all the circumstances and details of a situation can one make a proper decision concerning that situation. Let's face it, the work of the Devil HAS infiltrated the Church (Our Lady at Akita) and unless one understands how Satan works, and I mean has an in depth understanding of his tactics, he will never know how to handle the situation. And I can tell you that one man, even if he is Pope, will not be able to "clean up" the Church as it is today; it will have to be by a Divine intervention, such that there is a division within the Church so that the faithful Cardinals and Bishops can make the Consecration of Russia according to Our Lady's wishes--it's the only way. And under Francis, since it looks as if there is not going to be an effort to disinherit him, with all the Cardinals he's appointed it will be his modernist cohorts that will win any Papal election; the Consecration will NEVER be made under those circumstances! Let's face the FACTS. I think it is time we start divesting ourselves of the cultural psychological brainwashing we've been subjected to for the last 60 years. In the meantime we must be faithful to the Holy Rosary and Devotion to the Immaculate Heart of Mary, the last two remedies for us, as Sr. Lucia told Fr. Fuentes. Father David Belland has his own very compelling view of the BXVI situation. If anyone would like to learn more email him at frdbelland@netscape.net. 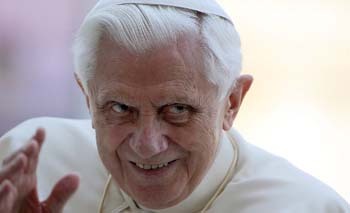 Pope Benedict, you worded your resignation in such a way as to render it invalid. I believe you did this to protect the Church’s indefectibility and to thwart the St Gallen mafia’s plan to validly elect an apostate to the papacy. That’s where BXVI’s skilled use of Latin comes in, which is analyzed brilliantly by Father David Belland. I will try to upload his analysis on twitter soon but it is longer than the space of a tweet ...so in the meantime he can be contacted at frdbelland@netscape.net. Please post what Fr Belland has to say. This was that whole embarrassing "Lettergate" scandal that actually got Msgr. Dário Edoardo Viganò fired. Yet no mention of it at all in Fr. Norton's TIA article. The report said that the Vatican admitted to blurring “the two final lines of the first page” where Benedict explains that he “didn't actually read the books in question” and “cannot contribute a theological assessment of Francis” as he had other commitments. AP’s report continued that the missing content “significantly altered the meaning of the quotes the Vatican chose to highlight, which were widely picked up by the media.” The suggestion given was that Benedict “had read the volume, agreed with it and given it his full endorsement and assessment,” it said. I posted the tweets that show Fr. Belland's email address for those who are interested in his Thesis. I received it over a year ago. Just ask him for it. The trad media, as well as all the trad priestly societies, have shown themselves very willing to be duped on the matter of Canon 332 and eager supporters of Bergoglio's claim to the papacy, despite all his public heresies, blasphemies and crimes. These make a joke of Tradition. #PPBXVI Our recent poll found that 99% of all those who read the canonical evidence that Pope Benedict's resignation was INVALID are convinced that it was invalid. That argues strongly that all Voices who hold that it is valid, are intentionally lying and/or refuse the evidence. Canon 332 §2 — If it happens that the Roman Pontiff renounce his MUNUS, there is required for validity only that he do so freely without unjust force and manifest it duly, but not that it be accepted or not by anyone at all. That makes his act of resignation NULL AND VOID, because its not in conformity with the obligation to renounce the papal MUNUS.